Alice Arlen (November 6, 1940 – February 29, 2016) was an American screenwriter, best known for Silkwood (1983), which she wrote with Nora Ephron. Her other film credits include the scripts of Alamo Bay (1985), Cookie (1989), The Weight of Water (2000) and Then She Found Me (2007). Born Alice Reeve to lawyer Jay Frederick Reeve and journalist Josephine Medill Patterson in 1940, Reeve and her brother Joseph later took the surname of Ivan Albright, their mother's second husband. She attended Radcliffe College of Harvard University, from which she graduated in 1962. She also received her MFA degree from the Columbia University School of the Arts in 1981. Reeve married James Hoge, a longtime employee of the Chicago Sun-Times in her native city after earning her degree and began working for CBS. The couple had three children before their divorce in 1971. She married Michael J. Arlen the following year and later moved to New York where she began studying at the Columbia University School of the Arts in 1979. Arlen met Nora Ephron, with whom she wrote the screenplay for Silkwood (1983), for which they were nominated for an Oscar for Best Original Screenplay. Arlen worked with director Louis Malle, writing the script for Alamo Bay (1985). Arlen and Ephron later worked together on Cookie (1989), which was directed by Susan Seidelman. Later, Arlen also wrote the screenplay for The Weight of Water (2000), and Helen Hunt's first feature film as director, Then She Found Me (2007). Arlen died at her home in Manhattan, New York in 2016, at the age of 75. ^ a b c McFadden, Robert D. (February 29, 2016). "Alice Arlen, Screenwriter With Premier Journalistic Pedigree, Dies at 75". New York Times. Retrieved March 1, 2016. ^ Vlessing, Etan (March 1, 2016). "'Silkwood' Screenwriter Alice Arlen Dies at 75". Hollywood Reporter. Retrieved March 2, 2016. ^ Saperstein, Pat (March 1, 2016). 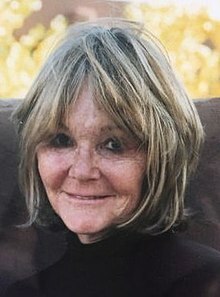 "Alice Arlen, 'Silkwood' Screenwriter, Dies at 75". Variety. Retrieved March 2, 2016. This page was last edited on 2 November 2018, at 02:20 (UTC).